Los Angeles, CA, November 18, 2014 — Targeted Medical Pharma, Inc. (OTCQB: TRGM) a drug discovery and development biotechnology company, today announced financial results for its third quarter ended September 30, 2014 and clinical trial updates. The company reported significant improvement in both net loss and net loss before interest, taxes, depreciation and amortization, and stock based compensation (Adjusted EBITDA*) on a quarter-over-quarter basis. In Addition, in Q3, the company reported major advances in the development of new treatments for both chronic low back pain and Posttraumatic Stress Disorder, publishing new data for the products Theramine, Sentra AM and Sentra PM in The American Journal of Therapeutics and The Journal of Central Nervous System Disease respectively. A copy of Targeted Medical Pharma’s quarterly report on Form 10-Q for the three months ended September 30, 2014, filed with the Securities and Exchange Commission on November 14, 2014, is accessible on the Company’s website at www.tmedpharma.com and at the SEC’s website at www.sec.gov. Financial results for the three months ended September 30, 2014 compared to the three months ended September 30, 2013. Total revenue of $1.7 million, a 24% decrease from $2.2 million during the three months ended September 30, 2013. Total gross profit of $1.2 million, a 25% decrease from $1.6 million during the three months ended September 30, 2013. Adjusted EBITDA of ($0.3) million, a 73% improvement from $(1.1) million during the three months ended September 30, 2013. Net loss for the three months ended September 30, 2014, was $1.0 million compared to a net loss of $1.7 million for the three months ended September 30, 2013. The Company’s operating expense for the third quarter of 2014 was $1.9 million, a 39% decrease from the third quarter of 2013. Targeted Medical Pharma, Inc. is a Los Angeles-based biotechnology company that is committed to drug discovery and development. The company currently develops and distributes medications for the treatment of chronic disease, including pain syndromes, peripheral neuropathy, hypertension, obesity, sleep and cognitive disorders. The company also develops a line of dietary supplements designed to support health and wellness. The company manufactures 10 proprietary medical foods, and recently launched its first dietary supplement, Clearwayz™. The products are sold directly to physicians and pharmacies in the U.S. The company also is developing nutrient-based systems for oral stimulation of progenitor stem cells that differentiate into neurons, red blood cells, pituitary hormones including IGF-I. For Updates, Follow the Company on Twitter @tmedpharma or on Facebook at www.facebook.com/TargetedMedicalPharma. Los Angeles, CA, August 6th, 2013 — Targeted Medical Pharma, Inc. (OTCQB: TRGM), a biotechnology company that develops and distributes prescription medical foods, convenience kits and generic pharmaceuticals to physicians and pharmacies for the treatment of chronic disease, today announced that the company’s CEO and Chief Science Officer William Shell, M.D., will be presenting at the 2013 Southern California Investor Conference being held at the Island Hotel in Newport Beach, California on Thursday, August 8, 2013 at 8:30 a.m. PST. Interested parties may listen to the presentation through a live audio webcast available at californiastocks.com. Listeners are encouraged to visit the website at least 15 minutes prior to the start of the scheduled presentation. A copy of the presentation also can be found by visiting the events and presentation section within the investor relations portion of Targeted Medical Pharma’s website or by clicking here. According to a recent research report by Falls Church, VA-based Technology Catalysts International, the global medical foods market is estimated at approximately $12 billion and growing. The report notes that consumer and scientific interest in the relationship between diet, health, and alternative medicines has created an increased demand for medical foods. Targeted Medical Pharma, Inc. is a Los Angeles-based biotechnology company that develops prescription medical foods for the treatment of chronic disease, including pain syndromes, peripheral neuropathy, hypertension, obesity, sleep and cognitive disorders. The company manufactures 10 proprietary prescription-only medical foods, as well as 48 convenience packed kits, which pair a medical food and branded or generic pharmaceutical. These prescription medical foods and therapeutic systems are sold to physicians and pharmacies in the U.S. through the company’s subsidiary, Physician Therapeutics. These proprietary medications represent a novel approach to the management of certain disease states, focusing on safety and efficacy without the deleterious side effects of traditional, high dose prescription drugs. The company also is developing nutrient-based systems for oral stimulation of progenitor stem cells that differentiate into neurons, red blood cells, pituitary hormones including IGF-I. Los Angeles, May 15, 2013 — Targeted Medical Pharma, Inc. (OTCQB: TRGM), a biotechnology company that develops and distributes prescription medical foods, convenience kits and generic pharmaceuticals to physicians and pharmacies, today announced financial results for its first quarter ended March 31, 2013. The Company posted record quarterly revenue of $2.811 million for the first quarter ended March 31, 2013, compared to revenue of $1.375 million for the first quarter ended March 31, 2012, an increase of 104.4 percent. Revenues for the three months ended March 31, 2013 were $2.811 million, compared to $1.375 million for the three months ended March 31, 2012, an increase of $1.436 million, or 104.4 percent. The increase in revenue was primarily attributed to a significant increase in prescriptions among workers compensation and commercial providers, along with improved collection rates for new and aged receivables. Gross profit for the three months ended March 31, 2013 was $1.912 million, compared to $0.740 million for the three months ended March 31, 2012, an increase of $1.172 million, or 158.3 percent. The increase in gross profit was attributed to increased revenues resulting from a significant increase in collections and to a lesser extent payments associated with the Cambridge contract. The net loss for the three months ended March 31, 2013 was $0.270 million and the diluted loss per share was $0.01, compared to a net loss of $0.976 million and diluted loss per share of $0.04 for the same period in 2012. The decrease in net loss was attributed to higher revenue combined with modest growth in operating expenses. As of March 31, 2013 the Company had $34.6 million of unrecognized accounts receivables, not on the balance sheet due to our policy of not recognizing revenue for delivered product with a long collection cycle, until the cash is received. This unrecognized asset has the potential to become revenue in the future as the Company’s billing and collection subsidiary continues to collect accounts receivable on behalf of physicians using the Company’s managed business model and hybrid business model, for patient claims. 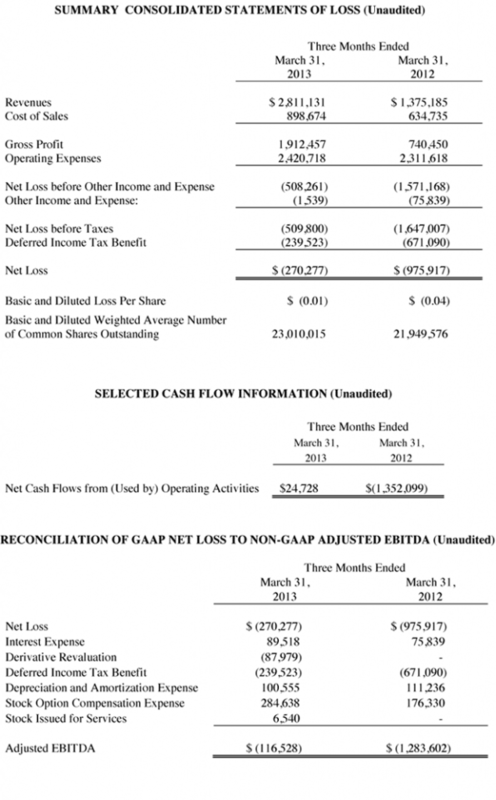 Adjusted EBITDA, a non-GAAP measure set forth in the table below, was negative $117 thousand for the three month period ended March 31, 2013, compared to negative $1.284 million for the three month period ended March 31, 2012, which is a reduction of $1.167 million or 91 percent. Conduct additional clinical trials for current and pipeline products including Theramine®, and new formulas for red blood cell production and nasal decongestion. Detailed financial data information is available on Targeted Medical Pharma’s annual report (Form 10-Q), which is accessible on the Company’s website at www.tmedpharma.com and on the SEC’s website at sec.gov/edgar.shtml. Targeted Medical Pharma is a Los Angeles-based biotechnology company that develops prescription medical foods for the treatment of chronic disease, including pain syndromes, peripheral neuropathy, hypertension, obesity, sleep and cognitive disorders. The company manufactures 10 proprietary prescription-only medical foods, as well as 48 convenience packed kits, which pair a medical food and branded or generic pharmaceutical. These prescription medical foods and therapeutic systems are sold to physicians and pharmacies in the United States through the company’s subsidiary, Physician Therapeutics. These proprietary medications represent a novel approach to the management of certain disease states, focusing on safety and efficacy without the deleterious side effects of traditional, high dose prescription drugs. The company is developing nutrient-based systems for oral stimulation of progenitor stem cells that differentiate into neurons, red blood cells, pituitary hormones including IGF-I. Targeted Medical Pharma also provides a billing and collection services on behalf of dispensing physicians. Statements made in this release include a non-GAAP financial measure. Such information is provided as additional information, not as an alternative to our consolidated financial statements presented in accordance with GAAP, and is intended to enhance an overall understanding of our current financial performance. We believe the non-GAAP financial measure provides useful information to management, investors and prospective investors by excluding certain charges and other amounts that we believe are not indicative of our core operating results. The non-GAAP measure is included to provide management, our investors and prospective investors with an alternative method for assessing our operating results in a manner that is focused on the performance of our ongoing operations and to provide a more consistent basis for comparison between quarters. The non-GAAP financial measure presented is Adjusted EBITDA (earnings before interest, taxes, depreciation, amortization, derivative revaluation, stock option compensation expense and stock issued for services). This term might not be calculated in the same manner as, and thus might not be comparable to, similarly titled measures reported by other companies. The financial statement tables that accompany this press release include reconciliation of the non-GAAP financial measure to the most directly comparable GAAP financial measure. This press release may contain forward-looking statements related to the company’s business strategy, outlook, objectives, plans, intentions or goals. The words “may,” “will,” “should,” “plans,” “explores,” “expects,” “anticipates,” “continue,” “estimate,” “project,” “intend,” and similar expressions, identify forward-looking statements within the meaning of the Private Securities Litigation Reform Act of 1995, but their absence does not mean that the statement is not forward-looking. These statements are not guarantees of future performance and are subject to certain risks, uncertainties, and assumptions that are difficult to predict. Actual results could differ materially. Targeted Medical Pharma expressly disclaim any obligation or undertaking to update or revise any forward-looking statement contained herein to reflect any change in the company’s expectations with regard thereto or any change in events, conditions or circumstances upon which any statement is based. Theramine® is a trademark of Targeted Medical Pharma Inc.
Los Angeles, March 4, 2013 — Targeted Medical Pharma, Inc. (OTCQB: TRGM) (OTCBB: TRGM), a biotechnology company that develops and distributes prescription medical foods to physicians and pharmacies, today unveiled new results from an open label study of its oral amino acid-based erythrocyte stimulating system (ESS) for the treatment of chronic anemia. The company’s ESS system is designed to stimulate progenitor stem cells in the bone marrow. Subjects in the study diagnosed with mild to moderate anemia were administered 1800mg of the company’s oral formulation daily for seven days. Each subject underwent weekly blood sampling, including hemoglobin, hematocrit and reticulocyte count for four weeks from the initial dosing, and once more 45 days following the initial dose. Hemoglobin increased an average of 11.39 percent from baseline measurement to 45 days. The average baseline hemoglobin measurement was 10.08 and 11.21 after 45 days with a similar increase in reticulocyte count (p<0.01). Preliminary results of the study released last year also found a 16 percent increase in hemoglobin and a 450 percent increase in peripheral reticulocytes over a seven day period (p<0.01) among normal volunteers taking ESS. The company plans to perform further testing of its red blood cell stimulating system and to explore treatment applications in other forms of anemia. neuropathy, hypertension, obesity, sleep and cognitive disorders. The company manufactures ten proprietary prescription only medical foods, as well as 48 convenience packed kits, which pair a medical food and branded or generic pharmaceutical. These prescription medical foods and therapeutic systems are sold to physicians and pharmacies in the U.S. through the company’s subsidiary, Physician Therapeutics. These proprietary medications represent a novel approach to the management of certain disease states, focusing on safety and efficacy without the deleterious side effects of traditional, high dose prescription drugs. Targeted Medical Pharma also provides diagnostic testing as well as billing and collection services on behalf of dispensing physicians. This press release regarding data results of an investigational study of a new formulation affecting the hemopoetic system may contain forward-looking statements related to the company’s business strategy, outlook, objectives, plans, intentions or goals. The words “may,” “will,” “should,” “plans,” “explores,” “expects,” “anticipates,” “continue,” “estimate,” “project,” “intend,” and similar expressions, identify forward-looking statements within the meaning of the Private Securities Litigation Reform Act of 1995, but their absence does not mean that the statement is not forward-looking. These statements are not guarantees of future performance and are subject to certain risks, uncertainties, and assumptions that are difficult to predict. Actual results could differ materially. Targted Medical Pharma expressly disclaims any obligation or undertaking to update or revise any forward-looking statement contained herein to reflect any change in the company’s expectations with regard thereto or any change in events, conditions or circumstances upon which any statement is based. Los Angeles, February 12, 2013 — Targeted Medical Pharma, Inc. (OTCQB: TRGM) (OTCBB: TRGM), a biotechnology company that develops and distributes prescription medical foods to physicians and pharmacies, today announced it has been issued patent number 8370172 from the United States Patent and Trademark Office. This is the company’s seventh patent and relates to a system and method for electronically submitting medication claims by point-of-care physicians. The patent officially was issued on February 5, 2013. “The issuance of this billing patent creates an opportunity for our company and we anticipate that this patent will help increase our revenue, spur development, and provide a powerful tool for our customers,” said William Shell, M.D., inventor of the patent, CEO and chief scientific officer at Targeted Medical Pharma, Inc.
More information on patent number 8370172 can be found by visiting http://bit.ly/TRGMPatent5 or clicking here. Targeted Medical Pharma, Inc. is a Los Angeles-based biotechnology company that develops prescription medical foods for the treatment of chronic disease including pain syndromes, peripheral neuropathy, hypertension, obesity, sleep and cognitive disorders. The company manufactures ten proprietary prescription only medical foods, as well as 48 convenience packed kits, which pair a medical food and branded or generic pharmaceutical. These prescription medical foods and therapeutic systems are sold to physicians and pharmacies in the U.S. through the company’s subsidiary, Physician Therapeutics. These proprietary medications represent a novel approach to the management of certain disease states, focusing on safety and efficacy without the deleterious side effects of traditional, high dose prescription drugs. Targeted Medical Pharma also provides diagnostic testing as well as billing and collection services on behalf of dispensing physicians. This press release regarding patent number 8370172 may contain forward-looking statements related to Targeted Medical Pharma’s business strategy, outlook, objectives, plans, intentions or goals. The words “may,” “will,” “should,” “plans,” “explores,” “expects,” “anticipates,” “continue,” “estimate,” “project,” “intend,” and similar expressions, identify forward-looking statements within the meaning of the Private Securities Litigation Reform Act of 1995, but their absence does not mean that the statement is not forward-looking. These statements are not guarantees of future performance and are subject to certain risks, uncertainties, and assumptions that are difficult to predict. Actual results could differ materially. Targeted Medical Pharma expressly disclaim any obligation or undertaking to update or revise any forward-looking statement contained herein to reflect any change in the company’s expectations with regard thereto or any change in events, conditions or circumstances upon which any statement is based. Los Angeles, January 30, 2013 — Targeted Medical Pharma, Inc. (OTCQB: TRGM) (OTCBB: TRGM), a biotechnology company that develops and distributes prescription medical foods to physicians and pharmacies, today announced it has received an Issue Notification from the United States Patent and Trademark Office (USPTO) regarding projected patent number 8370172, which relates to a system and method for submitting claims for a dispensed medication to a patient by point-of-care physicians. The USPTO indicated that it expects the patent will be issued on February 5th, 2013. Visit http://bit.ly/TargetedMedicalPharmaUSPTOPatent or click here for more information regarding the patent. Targeted Medical Pharma, Inc. is a Los Angeles-based is a Los Angeles-based biotechnology company that develops prescription medical foods for the treatment of chronic disease, including pain syndromes, peripheral neuropathy, hypertension, obesity, sleep and cognitive disorders. The company manufactures ten proprietary prescription-only medical foods, as well as 48 convenience packed kits, which pair a medical food and branded or generic pharmaceutical. These prescription medical foods and therapeutic systems are sold to physicians and pharmacies in the U.S. and the Middle East through the company’s subsidiary, Physician Therapeutics. These proprietary medications represent a novel approach to the management of certain disease states, focusing on safety and efficacy without the deleterious side effects of traditional, high dose prescription drugs. Targeted Medical Pharma also provides diagnostic testing as well as billing and collection services on behalf of dispensing physicians. This press release may contain forward-looking statements related to Targeted Medical Pharma’s business strategy, outlook, objectives, plans, intentions or goals. The words “may,” “will,” “should,” “plans,” “explores,” “expects,” “anticipates,” “continue,” “estimate,” “project,” “intend,” and similar expressions, identify forward-looking statements within the meaning of the Private Securities Litigation Reform Act of 1995, but their absence does not mean that the statement is not forward-looking. These statements are not guarantees of future performance and are subject to certain risks, uncertainties, and assumptions that are difficult to predict. Actual results could differ materially. Targeted Medical Pharma expressly disclaim any obligation or undertaking to update or revise any forward-looking statement contained herein to reflect any change in the company’s expectations with regard thereto or any change in events, conditions or circumstances upon which any statement is based. Los Angeles, January 7, 2013 — Targeted Medical Pharma, Inc. (OTCQB: TRGM) (OTCBB: TRGM), a biotechnology company that develops and distributes prescription medical foods to physicians and pharmacies, today announced that five of its core prescription-only medical foods are now listed on the U.S. Department of Veterans Affairs’ Federal Supply Schedule (FSS). The Company’s designated products are listed under the FSS category 65IB: Drugs, Pharmaceuticals and Hematology products. The listed products that are now available for purchase by federal agencies include AppTrim®, Theramine®, GABAdone® , Sentra AM® and Sentra PM®. The FSS listing of the Company’s products became effective with a contract award by the Department of Veterans Affairs to N3 Technologies, Inc., a Service-Disabled Veteran-Owned Small Business (SDVOSB), which is the contracted distributor to federal agencies for Targeted Medical Pharma. The FSS contract, V797D-30064, is effective through December 14, 2017. Targeted Medical Pharma, Inc. is a Los Angeles-based biotechnology company that develops prescription medical foods for the treatment of chronic disease including pain syndromes, peripheral neuropathy, hypertension, obesity, sleep and cognitive disorders. The company manufactures ten proprietary prescription-only medical foods, as well as 48 convenience packed kits, which pair a medical food and branded or generic pharmaceutical. These prescription medical foods and therapeutic systems are sold to physicians and pharmacies in the U.S. and the Middle East through the company’s division, Physician Therapeutics, These proprietary medications represent a novel approach to the management of certain disease states, focusing on safety and efficacy without the deleterious side effects of traditional, high dose prescription drugs. Targeted Medical Pharma also provides diagnostic testing as well as billing and collection services on behalf of dispensing physicians. This press release may contain forward-looking statements related to Targeted Medical Pharma’s business strategy, outlook, objectives, plans, intentions or goals. The words “believe,” “may,” “will,” “should,” “plans,” “explores,” “expects,” “anticipates,” “continue,” “estimate,” “project,” “intend,” and similar expressions, identify forward-looking statements within the meaning of the Private Securities Litigation Reform Act of 1995, but their absence does not mean that the statement is not forward-looking. These statements are not guarantees of future performance and are subject to certain risks, uncertainties, and assumptions that are difficult to predict. Actual results could differ materially. Targeted Medical Pharma expressly disclaims any obligation or undertaking to update or revise any forward-looking statement contained herein to reflect any change in the Company’s expectations with regard thereto or any change in events, conditions or circumstances upon which any statement is based. Los Angeles, November 27, 2012 — Targeted Medical Pharma, Inc. (OTCQB: TRGM) (OTCBB: TRGM), a specialty pharmaceutical company that develops and sells prescription medical foods to physicians and pharmacies for the treatment of chronic disease, today reported the completion of an agreement under which certain accounts receivables will be assigned to New Jersey-based Cambridge Medical Funding Group, LLC (CMFG). Under the terms of the agreement, medical providers who purchase products from Targeted Medical Pharma will have the option to assign certain accounts receivables from California Workers’ Compensation benefit claims to CMFG at a discounted rate. Based in Glen Rock, New Jersey, Cambridge Medical Funding Group provides specialized finance solutions to hospitals, surgical centers and medical providers, purchasing receivables and providing guaranteed upfront payments to these providers. Targeted Medical Pharma, Inc. is a specialty pharmaceutical company that develops and sells prescription medical foods to physicians and pharmacies for the treatment of chronic disease, including pain syndromes, obesity, sleep and cognitive disorders. The company manufactures nine proprietary prescription-only medical foods, as well as 48 convenience packed kits, which pair a medical food and branded or generic pharmaceutical. These prescription medical food products and therapeutic systems represent a novel approach to the management of certain disease states, focusing on safety and efficacy without the deleterious side effects of traditional, high dose prescription drugs. Based in Los Angeles, the company’s proprietary pharmaceutical therapeutic systems are currently sold in the United States, Japan, and the Middle East. Targeted Medical Pharma also provides billing and collection services on behalf of dispensing physicians. This press release about an agreement with Medical Funding Group, LLC may contain forward-looking statements related to Targeted Medical Pharma’s business strategy, outlook, objectives, plans, intentions or goals. The words “may,” “will,” “should,” “plans,” “explores,” “expects,” “anticipates,” “continue,” “estimate,” “project,” “intend,” and similar expressions, identify forward-looking statements within the meaning of the Private Securities Litigation Reform Act of 1995, but their absence does not mean that the statement is not forward-looking. These statements are not guarantees of future performance and are subject to certain risks, uncertainties, and assumptions that are difficult to predict. Actual results could differ materially. Targeted Medical Pharma expressly disclaim any obligation or undertaking to update or revise any forward-looking statement contained herein to reflect any change in the company’s expectations with regard thereto or any change in events, conditions or circumstances upon which any statement is based.